The Oliver 3 was produced between 1900 and March 1907, while at the same time an identical Oliver 4 was produced with foreign keyboards for the export market. The Olive-green color is typical for the Oliver typewriter, although the earliest models (and some later export models) were produced with a nickel-plated frame. The U-shaped typebars strike down from two sides. The Oliver first appeared 1896/7. Invented by the Canadian Rev. 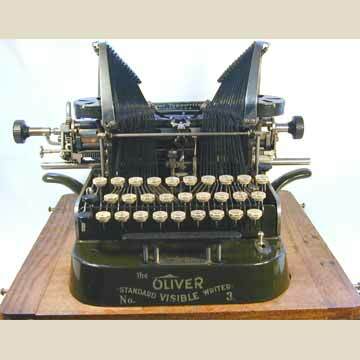 Thomas Oliver, the machine would live to be one of the most lasting alternatives of the regular front stroke typewriter. 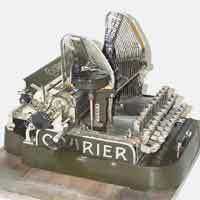 Although production in the USA ended in 1928, the British Oliver Typewriter Mfg Co would continue production of the downstroke until after World War II. Because of the relatively greater power of their striking, the Oliver was used by most companies as a stencil maker or "manifolder". 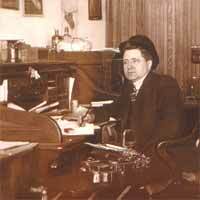 By 1920 or so other machines, especially those made by Underwood, were regarded as better for "business correspondence". Thus, for commercial sales, it was the original design that kept the company going until 1928. However, that very design limited the number of machines sold, marginalizing the Oliver to a "specialty"
More than one million Olivers were produced until the late 1920s, and the machine is fairly common even today, although complete and rust-free specimens like the one presented here are quite rare. In 1903, the A. Greger company of Vienna acquired the rights to produce the Oliver 3 in Austria, using the Courier brandname. Earlier they had made courier bicycles and sewing machines. The Courier was largely produced and assembled in Austria. And when the Oliver company moved on to later models, Courier continued production of the model based on the Oliver 3, but with some modifications and improvements. Production stopped in 1919, but apparently sales continued until 1927. For more information on the Oliver see the book â€œTypewriterâ€� page 117-119.